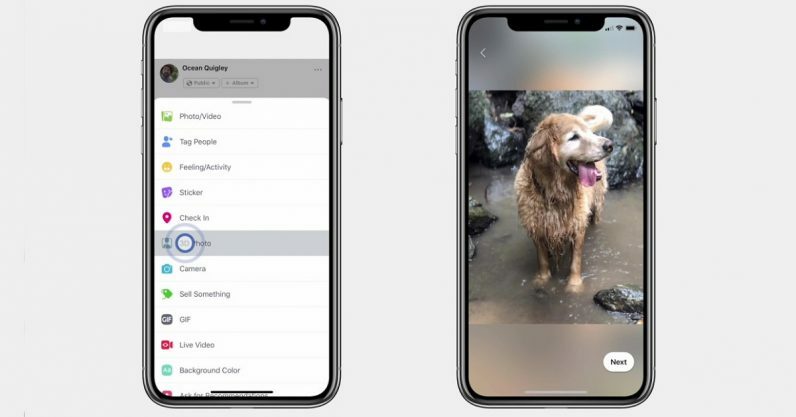 Facebook is rolling out a feature today which will allow users to post photos with a 3D effect to their feed — essentially photos that show your subject in richer detail. Despite the name , the photos won’t be truly 3D, per se. You won’t be able to spin a photo of your dog around to view her from every adorable angle, for example. But the photos will have depth that lets you see things from different angles and tilts within the photo. Facebook describes it as being kind of like looking at your photography subject if they were standing still behind a window. It won’t be possible for just anyone to take these kinds of photos. For starters, you’ll need phone with dual cameras. Facebook gives, as an example, all iPhones which have a “Portrait” mode. After you take the photo, Facebook uses AI to create the rest of the image based on what the cameras have taken — basically painting in the parts of the picture the camera doesn’t show. Facebook gives a brief tutorial explaining how to take the best 3D shots, which basically amounts to “don’t stand too close and use a subject with interesting color and texture” (thanks, Facebook, that’s not at all what I try to do with every picture I’ve ever taken). The photos can also be viewed within the browser of an Oculus headset, but it’s cool you don’t need one for the 3D effect. 3D photos are rolling out for everyone to view today, and the ability to upload one is rolling out to everyone in the coming weeks.